Our Chameleon Reactor Technology is a flexible, versatile reactor system that can readily adapt to your environment! If you are looking for a small volume, multi-vessel system that can be used for either Batch or Flow Chemistry, look no further than the Chameleon Adaptable Reactor Technology. With the Chameleon up to four reactors can be connected in series, offering the user an arrangement of Continuous Stirred Tank Reactors (CSTRs) for continuous processing. 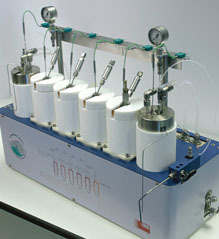 Samples can be removed from, or added to, any reactor; the outlet stream can be collected as a final product or can be used as an intermediate in a subsequent reaction. The Chameleon can also be operated as four reactors in parallel, giving the user access to processing in batch. For a full description, download our Chameleon brochure and take a look at the additional information and videos in our related links.